An Interfaith Couple on Intentional Parenting, Commuting and the Benefits of Raising an Only Child | Balancing Act | Kids VT - small people, big ideas! Burlington couple Josh and Mieko met in 2001 when they were teaching fellows at a residential high school in Estes Park, Colorado, and they have been together ever since. Though they come from different cultural backgrounds — Josh is Jewish and Mieko is Japanese and Chinese — they have a lot in common. They are both only children who grew up in cities — she in New York City, and he in Baltimore. They share a love of rock climbing and hiking, and value community. Their strong communication skills, and their mutual desire to reflect upon and improve their lives, serve them well as they navigate the challenges of parenting a toddler. Mieko: I am agnostic and Josh is Jewish. We celebrate the Jewish holidays. For the most part, for Josh I think it's the community aspect more than the religious aspects. I am more into observing that with him, and for Naomi it's to give her a sense of being part of that community. Josh: I think people need that origin. They become really uncentered if they don't have something, whatever that something is. I think it's human nature to need that spiritual grounding. I see people who desperately sought stuff out because they didn't grow up with it, and that's definitely something I want to provide Naomi. I'd like to have some of those Jewish traditions be part of our home, like Friday night Shabbat dinner. Mieko: Putting a challah [bread] together is nearly impossible on Friday evening! We like cooking and I used to bake bread and now it's like, "When are going to put a challah together?" Saturday night is much easier! Josh: The timing with both of us working is just crazy. I tried a couple of times, but I have to zip home at lunch, then leave work early to get it done, and it's just not reasonable. There is no good way to do it with both parents working. But I want her to grow up with that [Shabbat dinner] tradition. That's a goal of mine to work on for the next year. 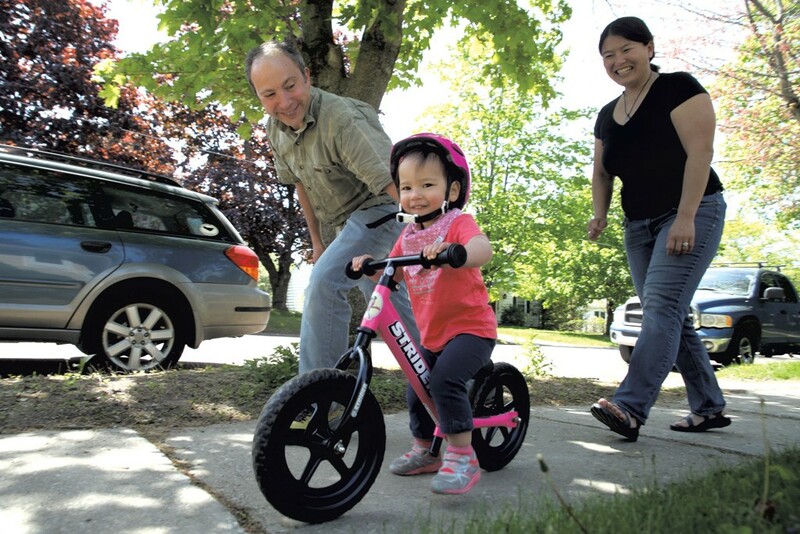 Josh: I got a used bike trailer so I can bike with Naomi and drop her off at daycare, and then I keep going to Champlain College, and come back to pick her up after I finish work. I am not hard-core enough to go through the winter, and even in the summer I will probably do it three to four days a week, and one day a week I'll need to run errands. But it's such a nice way to keep myself in shape. And Naomi loves it — she gets really upset if we have to get in the car, which is actually really good motivation for me. Mieko: When I was pregnant, I would walk to work every day — from my house in the New North End to the top of the hill at the University of Vermont, where I worked at the time. It was exactly four miles. I listened to books on tape and I think it made my pregnancy a lot easier. We got by with one car for six years! Josh: Now with Mieko's job an hour away and Naomi at daycare in town, I didn't want my only access to be by bike, and that wasn't going to fly in the winter so well. So we bought the second car. Mieko: It was hard, especially being into sustainability — a second car?! But we got a deal on a hybrid. Josh: The challenge of Vermont is that it's a small marketplace and invariably people no longer stay at their jobs for 30 years. Mieko changed jobs last year and liked the mission of the place [Yestermorrow], but it's an hour commute. It's worked out really well having her telecommute two days a week because I can plan certain things on those days to balance me out — like if I want to do something in the evening I will plan for it on those days. It's a strain, but I think it's really hard to get by on one salary anymore with the cost of living. I don't think we always thrive, but we always get by. Mieko: Intention. This is a word that came up for us before we had Naomi. Both of our parents waited to have us at a later age [in their 30s] as they focused on their careers and relationships. They were intentional in their parenting. My mom always told me that she and my dad talked through having me, and how they were going to care for a child. My mom took five years off to stay at home with me. After years of working with young people at a school in Colorado and organizations in both Massachusetts and Vermont, I think we both observed the impact of intentional and unintentional parenting. Josh: We are both only children, and I think there was a certain lack of chaos we both grew up with, so both of us are content having one kid. The nice thing about that, if we do it right, is that it gives us the ability to take her everywhere and do more things with her.